Heavy and awkward counters cost stone shops profits and skilled installers. No Lift Install System lowers unnecessary labor costs while improving quality and reducing install injuries, so you can increase your business's profits and retain your highly skilled installers. Are You Making These 5 Costly Mistakes At Your Fab Shop? No Lift Install System lowers unneccessary labor costs while improving quality and reducing install injuries, so you can increase your business's profits and retain your highly skilled installers. ImprovE YOUR PROFITS. RETAIN YOUR INSTALLERS. No Lift can save you up to $12,000 in labor costs a year. 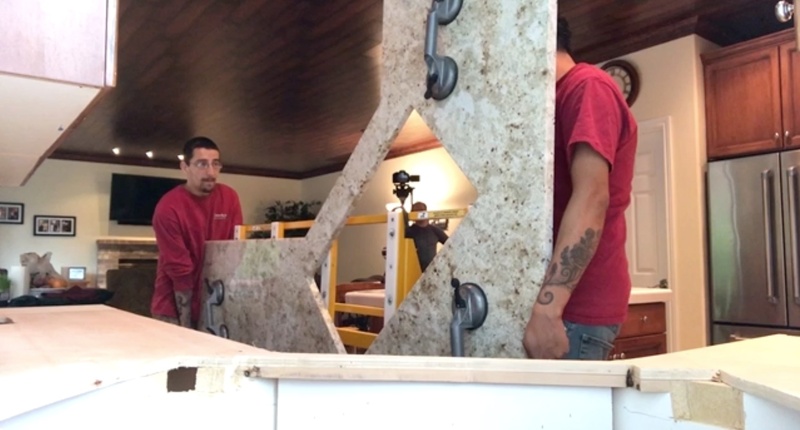 With the No Lift, you only need two installers to lift and place the slab. No Lift protects your crew and can save you $6,000 to $15,000 annually. Did you know your current installation process could be costing you up to $20,000 a year? Installing is one of the hardest jobs in the install industry. So how can you, as a fab shop owner, help set your installers up for success and make your business more profitable? Download our FREE Checklist, 5 Mistakes Fab Shop Owners Make, and get expert tips on how to improve your installers' work! There's no risk to buying the No Lift System. Use it for 30 days and if you aren't satisfied, we'll give you a full refund. We'll even pay the cost of shipping it back!